Inflict Direct Damage to you and your opponent’s Life Points during each of your Standby Phases. The first damage begins at 200 points and is doubled following each of your Standby Phases. Obligatory Friday fun pick. We're looking at one of the more...interesting burner cards. In other words, it can make the game a tie by the 6th turn it's out. 3200 and 6400 damage (heck, even 1600) is nothing to sneeze at. 2. The damage is kind of irregular. - In order to finish your opponent off on the 5th turn (3200 damage), you'd have to do at least 1800 damage to your opponent while having at least 6201 LP. While not impossible to do (LP recovery, anyone? ), it's iffy. You may put this card into your Cemetery from the Field during your Main Phase. Do 1000 damage to your opponent time the number of your Standby Phases that this card was on the Field after it was activated. While not bad, Dark Snake Syndrome doesn't work as well as Wave Motion Cannon does. I already have a really evil deck idea for Wave Motion Cannon. If anyone wants to see it, I'll post it in a column (maybe). If you build a deck around it, it's actually quite good. The challenge is actually doing that. Personally, it's too much effort, unless you can rack up damage on your opponent so quickly that they can get killed off by the 4th turn of this card, because you need to be careful that you won't get killed by it on the same turn, forcing a draw. With M/T removal rare in Draft, being able to do a lot of damage in a short amount of time is actually an advantage. Same rules apply about watching your LP. Effect: Inflict Direct Damage to you and your opponent’s Life Points during each of your Standby Phases. The first damage begins at 200 points and is doubled following each of your Standby Phases. Can burn opponent very quickly. Can burn yourself very quickly. Can be countered & destroyed easy. Magic Reflector - Just to keep it going longer. Any LP gainer - So you don't loose before them. More Burn cards - Speed up that burning feeling. This card is sick and should be used with extreme caution since both players will be taking the same amount of damage at the same time. 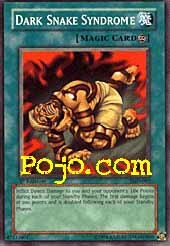 You'll have to back up your Life Points with some heavy LP gainer like Solemn Wishes, Gift Of The Mystic Elf, Cure Mermaid, Dancing Fairy, Marie The Fallen One, Etc. and the most effective way to use this card is in a straight Burn Deck with other burner cards like Fire Princess, Cannon Soldier, Burning Land, Chain Energy, Toll, Ookazi, Etc. so that you can inflict massive damage to your opponent in several turns before the Dark Snake bite starts to hurt yourself too much. Another good card to add into the mix is Bad Reaction To Simochi, so that if your opponent does try to gain their LP back they would end up loosing it even faster. If you do manage to get two Dark Snake Syndromes active at one time you can burn your opponent in several turns depending on what their LP is at when you activate the cards. I've yet to see this card played and have yet to try it out. It's definitely not a card that you can just throw into any Deck, it takes a bit of planning and strategy to get the best use out of it without it getting the best of you. ArtWork: 2.0 - It looks like the guy got a tattoo of a snake done with some poisonous ink. Either that or it's come alive and is strangling him the death, either way he'll be dead in less than eight turns.